If it’s the end of February half-term then it must be Sowing Sunday. This is the day which marks the start of the growing year for me, when the first chillies, aubergines, tomatoes and lemon grass are sown indoors. 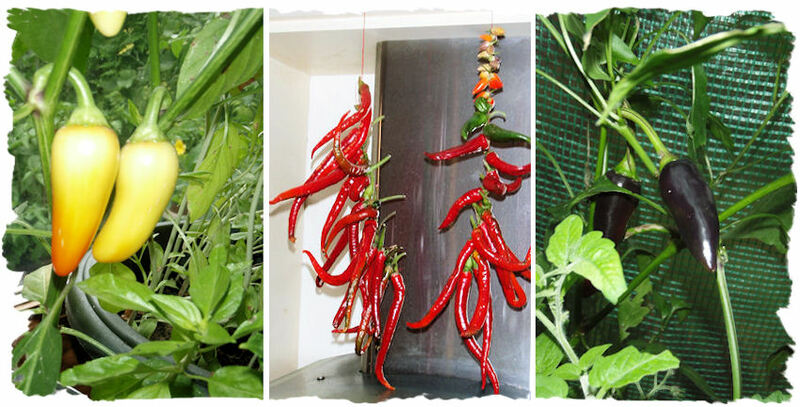 The chillies need to get off to an early start for what will hopefully be a nice long growing season this year. I’ve sown these in modules – two seeds per modules – and the trays are in a heated propagator right next to a bay window. The window is north-facing but gets lots of light. It’s a method that has always worked well although I always worry that this year nothing will germinate until I see the tiny green loops peep above the surface. The chillies are a) Cayenne, because the plants are heavy croppers, and the fruit are not too hot. They dry well and can be used to pep up so many dishes; b) Hot Lemon, because the combination of citrus+fire is irresistible. These are amazing sliced wafer-thin in salads, or stirred into Asian style soups at the last-minute, or made into a hot and slippery chilli jelly; c) Fish Pepper, because they are such attractive plants, producing multi-coloured, very pungent fruit (and because I had to pick most of them green last year – I want to see what they will be like in a good year); d) Black Hungarian for their gorgeous deep aubergine-purple colour and fruity flavour; e) Caldero, because they are mild and juicy and a beautiful eau-de-nil colour that slowly ripens to red like a tequila sunrise; f) Pimientos de Padron because I can fry them up and pretend I’m in a backstreet bar somewhere in Galicia; and g) Roberto’s, a Cuban chilli I’ve never grown before, but again, is meant to be flavoursome rather than merely fiery. Some early tomatoes (Black Russian, Marmande, Razzleberry) went in at the same time and they are up already. Also just beginning to show are a few aubergines, the last remaining seeds from a batch bought two years ago, which I sowed into the spare modules once the tomatoes were done. Both tomatoes and aubergines have been moved, still under cover, but unheated, to a south-facing window to grow on. From now until May, every windowsill in the house will be commandeered by seed trays and pots until I can trust the night temperatures and start moving seedlings out into the patio greenhouse. Next weekend I’ll start off a couple of pots of Genovese basil – too early really. I think basil needs stronger light levels. But in a month’s time, they will take off and I should be able to start picking by the end of April.